If you've ever been frustrated trying to start charcoal, the FlameDisk may be just what you've been looking for. FlameDisk is an alternative to charcoal, but it can be used in your old charcaol grill that may be sitting there gathering dust if you've had bad grilling experiences. All you have to do with Flame Disk is open it up and light it. That's it. 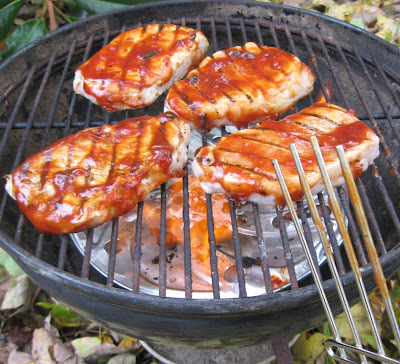 You are grilling in seconds and with no pain. Plus, you do not have any clean up with FlameDisk. FlameDisk is perfect for tailgating, but it's fine at home for barbecue parties or whereever you may want to fire up a grill. It's really a very simple grill accessory, but it does wonders for those who may be a bit grilling challenged. Above you can see the FlameDisk in my Weber Smokey Joe. It's a perfect fit in my tailgater grill, but it can be used in larger charcoal grills too. 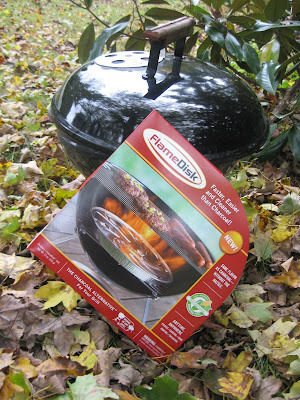 If you want to read more about FlameDisk, see my FlameDisk review at Yes You Can Grill, or you can find Flame Disk at my Yes You Can Grill Store. I've always said that there's a grill to match every personality and taste. In this case, it's not a grill, but FlameDisk could certainly make grilling easier and more fun for many who have had a hard time getting the hang of outdoor cooking. FlameDisk is nice, too, for pros when they don't want to have to think too much. You see the easiest pork chops I've ever grilled. Yep. It was a breeze to grill with FlameDisk, and there's no mess to worry about other than the dinner plates which are still sitting in the sink. I have not seen these. A couple of things I was wondering, how is it for flavor vs charcoal? How about heat ditribution? Any hot spots or easy flare ups? And cost? The flavor is closer to gas grilled than charcoal, but a lot of people apparently can't really taste that difference. FlameDisk burned nice and even overall. With sauce, that can drip and burn just a tad hotter. But, I did not find it to flare as much as many of the gas grills I've used. That would also be less noticed in a bigger grill vs this in a tailgate. There's more info in the link over at Yes You Can Grill. I got more detailed over there, since I don't like to make blog posts too long. Thanks for the responses. I live in a NFL city and near a NASCAR track and we have tons of tailgates here. I think this item would be great for those! Yes. I teach at a college, and a lot of the kids have probs getting grills going (adults too really). We have been test driving out in the yard, but this is a great product. Easy to use. No clean up. Safe too in terms of fire products. I'm in NASCAR country as well - close Charlotte.